If you’re reading this as an F1 fan the first thing that will probably pop into your head is, that’s the year Ayrton Senna died. Well of course you’d be correct, but for the Collins family that wasn’t the only tragic event to occur that year. My father had been fighting what seemed like an uphill battle at Team Lotus since the beginning of 1991, starting with no money and little sponsorship; Team Lotus ended their first year, with my father and Peter Wright at the helm, tenth in the Constructors Championship giving the team the bonuses, freight allowance and TV revenues that were vital to the team’s survival over the winter. In 1992 Team Lotus finished an incredible fifth in the Constructors World Championship showing that Lotus were on the right path of an upward trajectory. Their five year plan had been; 1991 stabilise and survive, 1992 regular points and top six in the championship, 1993 and 1994 wins, 1995 fight for the Championship. However, by 1994, their limited budget and the technical restrictions this situation imposed, saw them fighting tooth and nail to just stay above water. The infamous weekend of the 1994 San Marino Grand Prix is etched in the memory of every member of the Formula One paddock that was in Imola for that fateful weekend, not to mention in the minds of thousands of fans. Not only did Rubens Barrichello have a very big accident which resulted in injury, but Roland Ratzenburger and Ayrton Senna lost their lives in successive days. Nine spectators were injured by the flying debris from the explosive accident between Team Lotus’s Pedro Lamy and the stalled Benetton of JJ Lehto and, a Team Lotus mechanic was injured as a Minardi was leaving the pit lane following a stop, as a rogue wheel detached bouncing into the Lotus pit, knocking down two mechanics. As if the long list of the weekend’s dreadful events hadn’t felt like a warning to Formula One, the most vicious and violent ‘dry’ thunderstorm settled over Imola that evening as if to reinforce the darkness of the day. On the Thursday following the San Marino Grand Prix my father, along with many fellow Formula One members flew to Brazil for Ayrton’s funeral. There was a dark cloud settling over the world of Formula One, and the bad vibes continued at the following race with Karl Wendlinger’s high speed life-threatening accident at Monaco just two weeks later which left him in a coma for a number of weeks; but he eventually made a full recovery. Team Lotus and Pedro’s luck wasn’t getting any better either, as not even ten days after Wendlinger’s Monaco accident, Pedro crashed heavily in testing at Silverstone exiting Abbey Curve, breaking his thigh and both knee caps . The car was thrown over the catchment chain-link fence of the spectator area and ended up in a pedestrian tunnel under the bridge to the infield. The test was just two days before the team were due to leave for the Spanish Grand Prix, which meant they had to understand why the car had crashed and find a replacement driver at very short notice. Barely a month later, the phone rang in the early hours of the morning with further bad news, my father’s elder brother had passed away. Another tragedy in an already tainted year. We went to Australia within a matter of days to be there for the funeral. If the proceeding months hadn’t been tough enough, financial pressure was mounting, but there appeared to be a light at the end of the tunnel as there was encouragement from the engine supplier. A number of trips to Japan and numerous meetings indicated that corporate Japan would offer support for the future if Team Lotus could secure a podium. Team Lotus had a contract with Mugen, but much of the engine technology originated in Honda. Team Lotus badly needed some competitive results at Monza, and to show that their performance was improving with a podium. This would possibly encourage Honda to give more support and encouragement to potential sponsors. The brand new Mugen engine was compatible with only the new Lotus 109 chassis which was designed to accept the completely new engine. Johnny Herbert was given the task of showing what the new car could do at Monza in the Italian Grand Prix. It seemed like things were finally going to turn around when Johnny qualified a very strong fourth! The car was handling perfectly and the new Mugen V10 was strong. 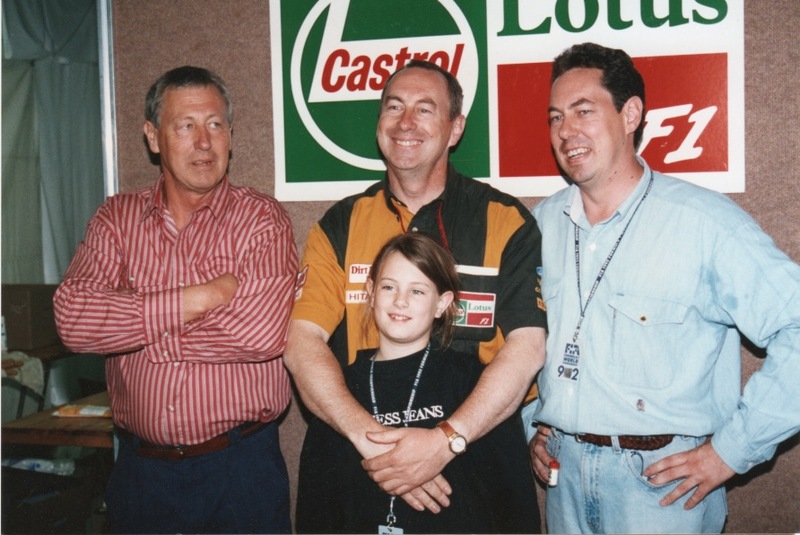 Team Lotus had a real chance of not only finishing in the points, but scoring their first podium since my father and Peter Wright took over the team! The Team were buoyant with high hopes following the excellent qualifying result, to the point that my father was so optimistic, he encouraged my mother to get on a plane from the UK to Italy for what everyone hoped would be the race result they anticipated. Johnny’s full tank race simulation run on Saturday morning matched the best of the opposition, and tyre wear looked good. Johnny made a fantastic start off the line and was eyeing up second as he braked for the first chicane. It was not to be as a completely rash move by Eddie Irvine, who locked up as he braked way too late for the chicane and kamakazied into the back of Johnny end Team Lotus’s hopes. The impact launched the 109 onto the kerb, destroying the underbody of the car and beaching him in the process. This caused massive chaos that resulted in a red flag and the race being re-started. 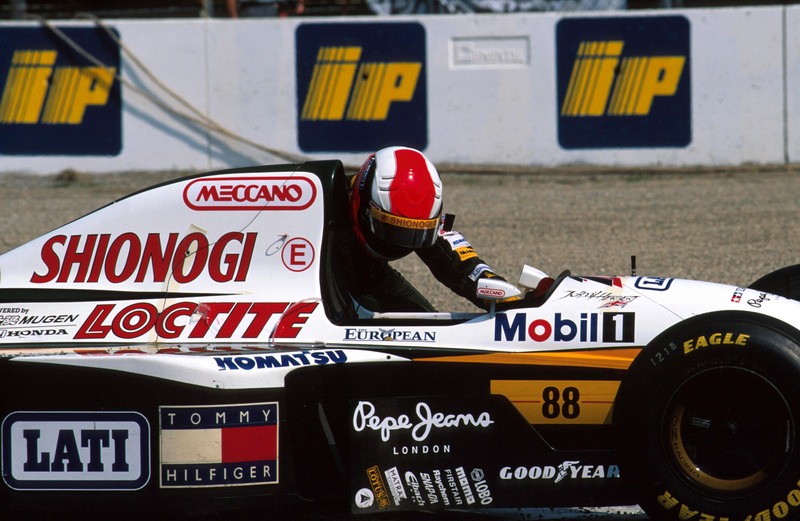 Irvine’s ludicrous move dashed all of Team Lotus’s hopes for the future in one fell swoop, as the damage was too great to take the restart and Johnny was forced to use the spare car and old engine. Without the new engine, the package just wasn’t competitive enough to keep him in contention at the front. Considering that one Ferrari didn’t finish the race, had Johnny been able to continue in the 109, there’s a very good chance he would have been on the podium. Some scathing comments followed from Johnny and my father, which although harsh at the time, were more understandable when the world learned of Team Lotus officially going into Administration on the Monday morning following Monza. Johnny seethed “Irvine has done far too much damage this year and should be properly penalized,” … “Formula One doesn’t need drivers like this.” My father was less diplomatic; “His brain has obviously been removed and it is about time that his license is too.” It is hard to disagree when you look at Irvine’s 1994 crash record. There were a number of people who were involved with Team Lotus at the time who offered to buy the Team from my father and Peter Wright. However, Lotus wasn’t just a Team and a Business for my father, it was a legacy. My father’s career started with Team Lotus, he was proud to work for the Team that had launched the career of his favourite driver, Jim Clark and had taken the great Scotsman to two World Championships. Colin Chapman had been a mentor to both my father and Peter Wright and they took pride in running Team Lotus in the spirit of which Chapman would have approved. With little option left, they took the decision to place the Team in administration on the Monday. The fate of the great team was then in the hands of accountants who sold off contracts along the way, finally selling the name and remaining assets to David Hunt. Despite a lot of bluster, David almost instantly fired nearly the entire Team and entered into a heated and misguided legal battle with a number of people who had been loyal and committed to the team, as well as the power brokers of the sport. It appeared to be the continuation of a well-established trend for David to manically and irrationally litigate. David’s intentions for the Team were exactly what my father and Peter Wright wanted to avoid. 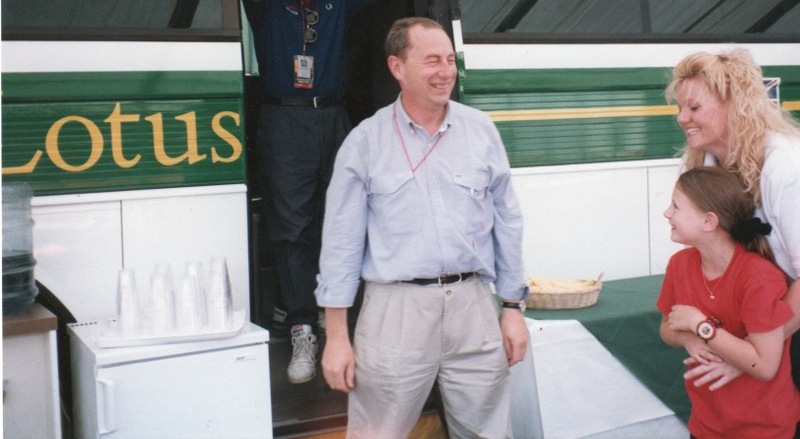 David wanted the glitz, glamour and glory, he lacked the understanding of the legacy of the real Team Lotus, and ultimately it caused the Team to come to a very unbefitting and sad end. He just never grasped the heart and soul of Team Lotus! I struggle to put into words just what Lotus meant to me. It was such a big part of my childhood, and I hold such wonderful memories of the drivers, factory and staff. It really did feel like a big family and it was no surprise to me when former team members, (who had gone to other Formula One teams following the demise of Team Lotus), started to call my father asking when he would start another team. It isn’t a brand, or a name, that makes a team, it’s the people and their combined desire to work towards the same goal. The name ‘Team Lotus’ without the spirit of the founder would never have the same meaning. Chapman’s Team Lotus disappeared with the closure of the 1994 Formula One Season. The spirit that inspires people to fight against the odds, and to commit whole-heartedly. That, you just can’t buy. © Samantha Collins. This article may not be copied or distributed in part or in whole without the consent of the author.